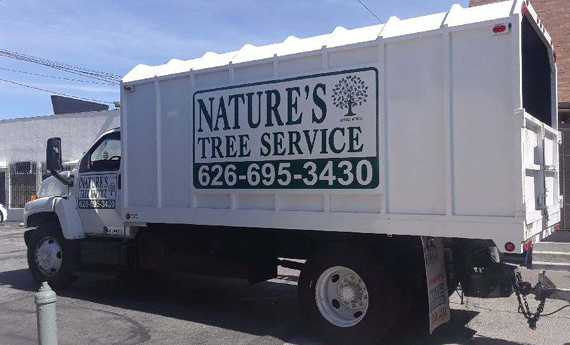 Welcome to Nature's Tree Service, a trusted name in the tree service industry. We provide residential and commercial landscaping, tree trimming, tree removal, and other yard services. Our goal is to take your property and enhance it, bringing out its natural beauty. We believe every yard can truly shine with just a little bit of blemish control. Our team has years of experience in the industry. We have the knowledge and the skills any professional landscaping team would have, but our reputation is based on more than just that. It's our dedication to our customers and our goal of providing service that exceeds all expectations that has made us a trusted name in the area. All of our services are done quickly and affordably without cutting any corners. When you hire us, you’re getting the best! We guarantee that you’ll be pleased with our work. We promise to provide you with reliable tree trimming and removal services along with dependable landscaping and other services. We keep all of our work as budget-friendly as possible. Good landscaping isn’t something that you should assume is out of your price range – it’s not! We’re experienced in tree trimming and safe limb and tree removal, plus we offer a wide range of different services to transform your property into a beautiful landscape. We specialize in safe tree removal and trimming along with a full range of additional services to enhance and beautify your property. Our team has spent years gaining the knowledge needed to stand out as true specialists in tree removal. When you partner with us, you can rest assured that your landscaping will be done quickly and professionally. We're fully licensed, insured, and bonded for your protection. Want to see some of our previous success stories? We have a full portfolio of previous work to share. If you have a landscaping project you'd like to discuss or need some trees trimmed, contact us today to discuss the specifics. was 100% pleased with the service and the excellent job done. I had an appointment for a quote and the company rep showed up right on time. He gave me a detailed proposal after discussing the various trees on our large property. I appreciated the fact that I was told that several trees did not need attention for another year or so. The crew arrived right on time a few days later to do the work. They did an EXCELLENT job on all the trees. The shaping and thinning was perfect. They cleaned up beautifully and nothing was damaged. I would highly recommend this company (and have done so to friends who have also used them and really appreciated their great work). I think that their prices are right in line. This tree service business really knows about horticulture and the proper way to trim, repair, & maintain trees. We have a large lot with many mature trees - David and his crew expertly cared for every variety. They cleaned up every shred of debris and have a great friendly manner. Lots of integrity with this company. Highly recommended. I am definitely a fan of Nature's Tree Service. We have several large oak trees on our property and have struggled to find the right balance of good service, professionalism (licenses and insurance), pricing and knowledge. We first hired David and team to clean up after the major wind storm damaged our trees several years ago. When it came time to do a follow-up trim on our oak trees, David and team offered a competitive bid, showed up when promised, and did work that exceeded my expectations. I look forward to doing business with them in the future and am currently recommending them to my family and friends.